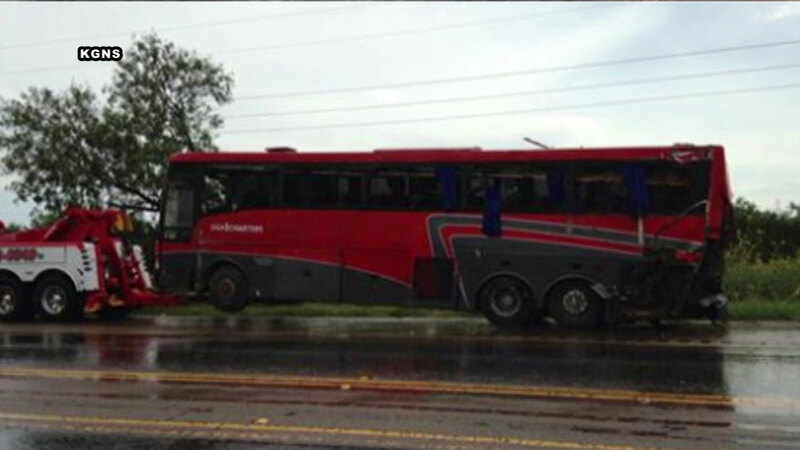 LAREDO, TX -- A charter bus headed to a casino crashed in far South Texas on Saturday, killing eight people and injuring 44 others in a one-vehicle rollover, officials said. Seven people died at the scene on U.S. Highway 83 about 46 miles north of Laredo and another died later at a Laredo hospital, Texas Department of Public Safety Trooper Conrad Hein said. The trooper said it was raining Saturday morning but it was uncertain if that was a factor in the crash that occurred just before 11:30 a.m. He said no other vehicles were in the area at the time. Webb County Volunteer Fire Department Chief Ricardo Rangel told the Laredo Morning Times the bus belonged to OGA Charters was headed to a casino in Eagle Pass, about 125 miles northwest of Laredo. The bus company is based in San Juan, in Hidalgo County in Texas' Rio Grande Valley. A message left at the bus company Saturday was not immediately returned. The crash is one of the deadliest bus accidents in Texas in the last several years. In January 2015, two state corrections officers and eight inmates were killed after their Texas Department of Criminal Justice bus struck a piece of displaced highway guardrail west of Odessa. The bus fell about 20 feet before striking a Union Pacific freight train that happened to be passing beneath the highway. Last Thursday, the NTSB concluded that the wreck was caused by the bus hitting the guardrail piece. Although the retread itself wasn't the cause, the panel noted that the tire was affixed to the front axle illegally, the bus company didn't have the authority to leave Texas after failing an inspection three months earlier, and the company that inspected the bus wasn't equipped to judge whether it was roadworthy. The owner of the Houston bus company was charged with making false statements but avoided prison in 2014 after a federal judge sentenced him to three years of probation in a plea agreement.